Does my chimney need a liner? NFPA enforces that chimney’s must have a liner that is able to contain the materials of combustion. Remember that you may have a liner but if it is not in good shape it is basically useless. Have your chimney inspected today. How long will a chimney cleaning take? It really depends on how much material we are extracting from your chimney. If you have a large amount of buildup it may take us longer. Usually no longer than one hour though. How does a dryer fire start? A dryer fire starts as a result of a clogged dryer vent. If the dryer vent is completely full the dryer naturally drys at a much hotter temperature and often leads to serious house fires. Why do I need a chimney Cap? A chimney cap protects your chimney from any debris or wildlife entering your chimney. It protects your chimney from nesting or deposits of leaves and other flammable material. What should I do if I have a chimney fire? If you have a chimney fire immediately shut down your air damper then check the entire chimney system to make sure the fire has not escaped from inside your chimney. Carefully watch the flue temperature and wait it out. If it has escaped call the fire department immediately. Can I get replacement glass for my fireplace doors? Yes, we can provide high temp tempered glass for fireplace doors. We can custom fit the glass to fit your door. Call us today to start discussing your options further. How often should my dryer vents be cleaned? For the average family that uses their dryer semi-frequently cleaning your dryer vents twice a year is sufficient. If you use your dryers much more frequently you may increase that number. What is making my chimney smell? Eventually, if there is enough creosote in a chimney, it will seep into the walls and on a hot or humid day the smell will be evident. If your chimney is smelling call us so we can remove the dangerous material from your chimney and eliminate the odor. What does a chimney sweeping entail? The chimney sweep will fully clean your chimney removing all dangerous materials that may have collected in your chimney. They will take all proper actions to clean any debris that may have collected in your chimney. In addition they will disclose to you any damages or issues they may have seen during their time cleaning. Do I need to reline my chimney? Many chimney liners deteriorate over time. If you are unsure about your liner the safest option for you is to schedule an inspection. Not only will we review your chimney liner, we will inspect all aspects of your chimney giving you a detailed list of the maintenance needed. Why is my furnace making a noise? This is a very common sign that your furnace needs maintenance. As furnaces get old they require repairs to keep them functioning at a high level. If you can hear your furnace making an unusual noise or is running louder than usual have it inspected by our services today. The flue is the passage inside of your chimney that the gasses pass through. It allows the gasses to leave your home and exit your house entirely. Flues must be lined with a certain approved material. Do I need chimney caps? Chimneys should be covered according to NFPA code. Caps work for you even when your chimney is not working. They can prevent water damage, and wildlife from entering your chimney. My damper is not moving, can it be repaired? Does it really need to fully open and close? Your damper should be fully open when you are burning to allow all of the gases and smoke to escape the chimney promptly. What is a chimney inspection and when do I need one? A chimney inspection is an examination in the exterior and interior of a chimney for damages, deterioration, or combustible material buildup. If you use your chimney frequently you should have yours cleaned and inspected at the end of each usage season. Does it make a mess? We have the proper equipment to clean the chimney without making a mess. Our job is cleaning and we want to leave your home the way we found it. Clean and mess free. 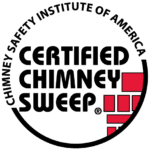 How often should I sweep my chimney? The National Fire Protection Association says that chimneys, vents, and fireplaces should be inspected annually for soundness, deposits, and clearances. Repairs will be done if necessary. When is the best time to clean my chimney? Spring is the best time of year to have your chimney services done. Once the fall arrives most chimney business are very backed up. Also, you should have your chimney serviced directly after the winter months of heavy usage so the dangerous creosote does not sit in your chimney for an extended period of time. This is the most dangerous level of creosote buildup you can have. This is an accident waiting to happen. If you have any reason to believe that you have excessive creosote build up do not start another fire and call us today.